For more than 125 years, the Wall Street Journal has been a trusted source for unparalleled analysis and unique reporting, informing decisions that drive the world forward. 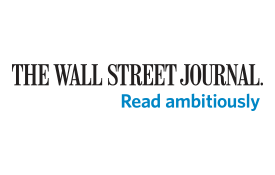 Published by Dow Jones, the Wall Street Journal explains the world of business through breaking news, interactive features, video, online columns, and blogs. Emirates Skywards Platinum members can enjoy a complimentary digital subscription to the Wall Street Journal. Register here. Redeem your Miles for a 12-month digital subscription to the Wall Street Journal and get access to the latest breaking news, interactive features, videos, and blogs online. Be part of a global conversation with the world’s intellectual leaders and enjoy unique insights into the world of business. Redeem 20,000 Skywards Miles for a 12-month digital subscription to the Wall Street Journal. Once you’ve redeemed your Miles, activate your subscription using the link provided on the purchase confirmation page and in the confirmation email you will receive. You can also redeem Miles for additional subscriptions for family and friends. For each subscription, you will receive a separate email with a unique subscription link. Emirates Skywards members can redeem 20,000 Skywards Miles for a digital subscription to the Wall Street Journal. Miles can be redeemed for multiple digital subscriptions, which can then be passed on to family and friends as gifts. Each recipient should activate his or her subscription independently. Skywards Miles will be instantly redeemed from the Emirates Skywards membership account. Skywards Miles can be deducted from only one membership account per subscription. The subscription to the Wall Street Journal is valid for 12 months from the date the Miles are redeemed. Once redeemed, Skywards Miles are not refundable. Redemption of digital subscriptions to the Wall Street Journal is not available in China. Once Miles are redeemed, the Emirates Skywards member will receive an email with a dedicated link to activate the subscription. The Wall Street Journal subscriber agreement conditions apply.